They were the people of Mongolian origin who came across the now-extinct land-bridge from Asia, or, later, in boats across the Bering Strait. They migrated about in both Americas, lived long in some places---where they developed cultures and constructed languages---and migrated again en masse or in small groups up to and after the appearance of white men. They were the people who spoke some two hundred languages and who dwelt in many culture areas, each with its different way of life. Their span of life in North American can be measured back thousands of years, to the misty past of the extinct animals and the last ice age. They were the Indians and Eskimos who settled North America. 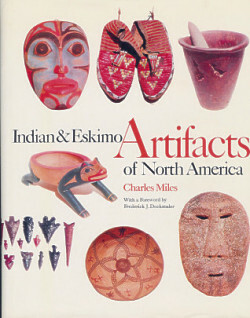 In Indian & Eskimo Artifacts of North America we find their most valuable legacy -- their artifacts, those "human-altered objects made and/or used by North American Indians and Eskimos." This lavishly illustrated guide presents fine examples of implements used for gathering, preparing, serving, and storing food; household effects including fire-making apparatus; tools for manufacture; men's and women's clothing; items for personal adornment; religious articles; objects of art and musical instruments; toys, games and sporting items; vehicles for travel overland and by water; and weapons for combat. In all, there are over two thousand samples of North American native-made and -used artifacts.